Thread: OT: "The Bloody Hundredth"
This is the 100th thread on NSN 6645 so I thought that we should mark it with a tribute to this most famous USAAF bomb group of WW2, "The Bloody Hundredth", which was based in East Anglia. During WW2, the 100th Bombardment Group (Heavy) was a Eighth Air Force B-17 Flying Fortress unit stationed at RAF Thorpe Abbotts. They flew over 300 combat missions, earned two Distinguished Unit Citations (Regensburg, 17 August 1943 and Berlin, 4,6 and 8 March 1944). They suffered appalling losses in combat, (177 Aircraft MIA), flying their last mission on 20 April 1945. Here is the link to the official website http://www.100thbg.com/. The official line is as follows: "The Group arrived in England in late May of 1943. Heavy losses early in June through October 1943 earned them the sobriquet "The Bloody Hundredth". No combat unit sustained such heavy losses as the Group's original flight crews, only four of the original thirty-eight co-pilots completed their combat tour of twenty-five missions, in fact three Flying Fortresses were lost on their first mission on June 25, 1943. The 100th was made up of swashbuckling men, from their Commanding Officers down through the ranks of both the flight and ground personnel, proud to be recognized as a member of the "Bloody Hundredth" yet a little fearful. They drew the dreaded "Tail end Charlie" position on the terrible Regensburg shuttle mission of August 17, 1943 and were the high group on the October 8, 1943 Bremen mission and again two days later at Munster. If enemy fighters were encountered, as they were on these missions, the positions the 100th occupied were certain to be the focal point of their attacks. These three missions cost the group 28 Flying Fortress shot down. On the Munster mission only one 100th aircraft returned to their base at Thorpe Abbotts, England. Such is the stuff legends are made". One unofficial story goes that it was the aircraft of Captain R. Knox that initiated the infamous legend of the "Bloody 100th." Knox found himself in serious trouble after one of the fighter attacks. For a time his B-17 lagged with one engine out. Almost a stationary target, he became the focus of sustained fighter attacks. A second engine then failed. 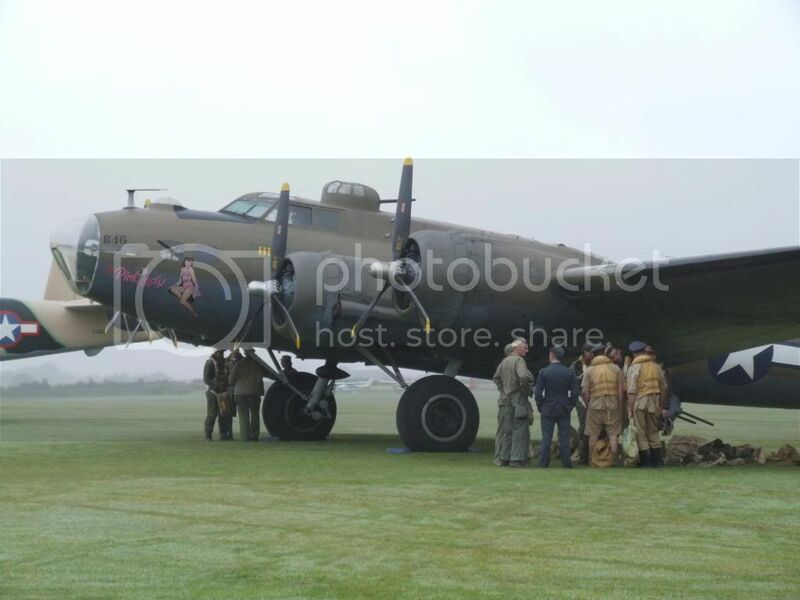 According to an observer, the wheels of the B-17 were lowered. This was a signal to the Luftwaffe that they had surrendered so according to the code of the air, once this was done attacks upon the bomber would cease. To guide Knox in toward a German airfield a few fighters pulled alongside. Then for some reason, possibly because their engine trouble cleared up, the gunners aboard the B-17 blasted the escorting fighters. The wheels went up and the bomber made a dash for home. Within seconds the furious fighters tore the Fortress to pieces and it went down. After the violation of the code of the air, so the legend goes, the 100th was marked for extinction by the Luftwaffe. It had become a personal grudge by the Luftwaffe against the Bloody 100th. Why my interest in this Group? I had been suffering from recurring flashbacks following a near fatal bi-plane crash for nearly a year, when we went on a holiday to Suffolk and Norfolk. Once there, I discovered all the old airfields, many hidden away and slowly being reclaimed by Nature. They were very atmospheric and it reminded me of the opening scene in "Twelve O'Clock High", when post-war, Oscar-winning actor Dean Jagger, playing the former squadron adjutant, returns to his now abandoned airfield for one last look. Thorpe Abbott, where "The Bloody Hundredth" were based, was one of those bases we visited. Miraculously, after that trip the flashbacks disappeared - I can only guess that the thoughts of what had occurred at those bases and the sacrifices of those brave aircrews put my own trauma into perspective. If you want to read moreabout the 100th, then I can recommend Harry Crosby's book http://www.amazon.com/Wing-Prayer-Bl.../dp/0061008125. Last edited by StampeSV4; 25-02-2010 at 21:13. That's an interesting story, Jon. I've just sworn off biplanes. Reminds me of the scene in "The Best Days of Our Lives" where Dana Andrews visits the abandoned airfield.